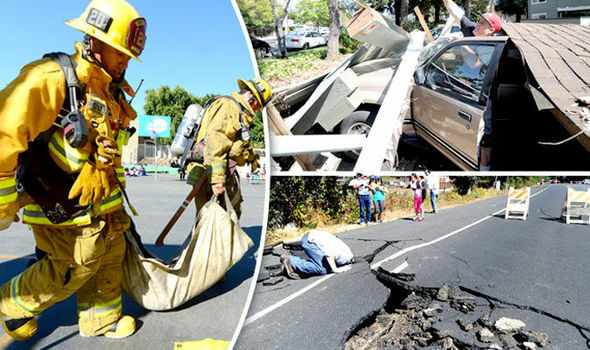 HUGE earthquakes are set to “DESTROY Earth” in just a WEEK following a rare series of lunar events, self-styled ‘prophets’ have claimed. 2 Christian preachers w/huge followings in the US claim the date of the last of 4 ‘blood moons’ over the past 18 months, due to occur on September 28, & following a papal visit to the US, will signal the 2nd coming of Jesus Christ. At the same time, the world as we know it will be destroyed by major earthquakes amid heightened tensions in the Middle East & the possibility of a 3rd world war. The 2 evangelists have been accused of peddling the false warnings in order to cash in on books they have penned about their predictions – 1 of which was turned into a movie. The pair claim Armageddon will occur at the conclusion of the ongoing ‘tetrad’ of blood moons, which began on April 15 last year, followed by another red-coloured lunar eclipse on October 8 last year, & a 3rd on April 4 this year. The 4th in the series of blood moons, which have 6 full moons in between, is set to happen on September 28. The incredible alignment of blood moons has only happened a handful of times in the last 2,000 years, w/pastors Mark Blitz & John Hagee claiming they have historically coincided w/a globally significant religious event. Mr. Blitz, of El Shaddai Ministries in Washington & who wrote ‘Blood Moons: Decoding the Imminent Heavenly Signs’, has found historical blood moon tetrads coincided w/significant historical events for Israel & Jewish people. These include the formation of the Jewish state in 1948, the 6-Day War for Jerusalem & even the expulsion of Jews from Spain in 1492. The current tetrad of blood moons have coincided w/Biblical feasts, w/Passover beginning on April 3 – a day before the last blood moon – & September 28 this year marking the 1st day of the Feast of Tabernacles. Mr. Hagee, founder & senior pastor of a “megachurch” in Cornerstone, San Antonio, Texas – which has more than 20,000 followers – is also claiming to have made the discovery in his book ‘Four Blood Moons’. The book has made it onto the New York Times’ bestsellers list & since been made into a documetary-syle movie of the same name. Mr. Hagee claims that while Americans watched the latest blood moon in April, the Ukrainian government launched its 1st offensive to take back buildings occupied by Russian-backed separatists. He said the Ukraine crisis has since escalated & it is feared if the US gives Ukraine military aid, it could trigger a 3rd world war.